Research suggests that customers are most receptive to your marketing messages in the wake of a purchase - Experian, for example, reporting that post-purchase open rates are double that of regular bulk promotional emails. It makes sense - buying new stuff is exciting, after all. Smart online retailers are realising that this sense of post-purchase euphoria is a massive opportunity when it comes to fostering loyalty and laying the groundwork for further purchases. Relying on the unbranded, impersonal transactional emails that often come as default with your ecommerce platform is a sure-fire way of raining on the parade of any new purchaser. What they’re also inadvertently saying is, ‘we’re willing to pull out all the stops to get you to part with your money but now you have, we’re not going to bother making an effort’. Share in your new customer’s excitement - reinforce that they’ve made a great decision, and leave them confident in buying from you again. Copy: make sure that your brand tone of voice comes across in your post-purchase emails (see a good example from JOY below). Your customers are looking forward to the arrival of their purchase - make the post-purchase experience upbeat and positive! Branding: ensure there’s continuity between your site and your post-purchase emails. Strong aspirational imagery (like the header in JOY’s email below) also helps create a sense of excitement about the brand image that your new customer is buying into with their new purchase. While repeat purchases are the ultimate goal in retention marketing, it’s important to remember that the timing of your marketing messages is crucial, and a customer may not be ready for the hard-sell right after they’ve made a purchase. That said, it’s important to keep them engaged and interested in the meantime. 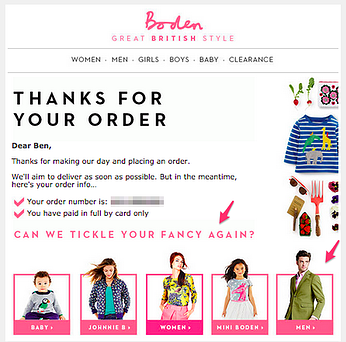 Below are some examples of calls to action within transactional emails (or as a separate triggered email in the case of ASOS) that subtly tempt new purchasers back on-site to have a browse, or call new customers to follow the brand on social media. While returning to the website isn't the most compelling of calls to action straight after a purchase, encouraging micro-conversions like following on social (with convincing CTA copy, of course) can be a great way of keeping in touch. Customer reviews are super valuable to online retailers for a multitude of reasons: they give useful feedback, they’re amazing social proof that can have a significant impact on conversions (more on this here), and they’re also great for SEO. From a customer loyalty point of view, they’re a good excuse to check in with a customer following a purchase, to keep you front of mind and to demonstrate top customer service. Most importantly, however, they’re an opportunity to set up another purchase. Here’s how (and how not) to do it. Here’s an example of a feedback email I received from House of Fraser. ‘Our customers’ feedback really helps us continue to improve’ - good for you, but what’s in it for me? ‘It will take just 10 minutes to complete’ - Ten minutes of my time for nothing in return? Are you having a laugh?! The trouble with this email, and many review requests in general, is that it focuses too much on the individual transaction instead of playing the long game. If you’re serious about retaining customers, there should be no ‘dead ends’ in your marketing - every customer communication should be used as an opportunity to nurture customers into that next purchase. Incentivise them to leave a review. This is a really great tactic on two counts. Firstly, customers are likely to be more willing to leave feedback, because they feel they’re getting something in return (you scratch my back, I’ll scratch yours etc. etc.). Secondly (and perhaps more importantly), you’re inadvertently encouraging them on in their customer journey with you. In their eyes, you’re giving them something nice in return for their time. From your perspective, you’re gaining a valuable review, as well as increasing the chance they’ll come and spend with you again using their discount. Good times all round. Above we covered how to use customer feedback requests to sow the seeds for a future purchase, but there are other methods of setting up the next purchase, too. Some recent purchasers might be ready to buy again straight away. 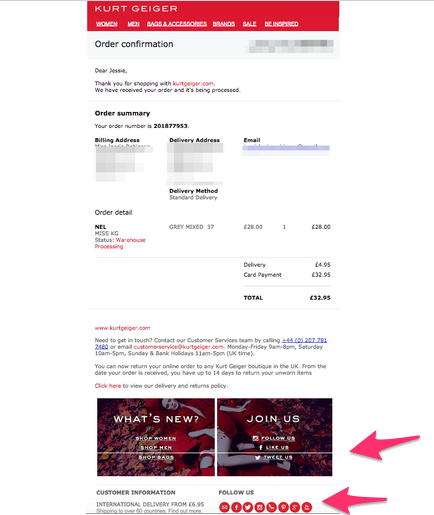 Adding a ‘you may also like’ recommendation box to your post-purchase emails (like House of Fraser in their order confirmation email) is a nice way of subtly coaxing them into making a quick follow-up purchase, without being too pushy. As I mentioned above, there’s nothing quite like a discount or other form of ‘deal sweetener’ like free P&P to get that all-important follow-on purchase. Before we look at some specific strategies, it’s worth noting that this approach may not be right for everyone (as discounting is not always in line with brand image and pricing strategy). Moreover, it should be used sparingly (i.e. not every time someone makes a purchase), as this can harm your credibility and brand integrity. 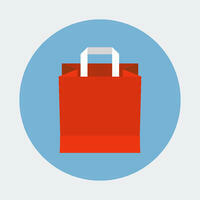 You may decide to send a discount to first-time purchasers (to encourage them to make a second). On the flipside you don’t want to offer money off to loyal, repeat customers who would have paid full price anyway! Wool and the Gang uses its order confirmation to promote its loyalty scheme, which offers a free order up to the value of £200 if you introduce friends to the brand. ArenaFlowers sends a 10 per cent discount coupon to new customers, and has created a series of reminder emails over the following weeks to help you remember to claim it. For some online retailers, a quick follow-up purchase is very unlikely. Schuh has come up with an interesting seasonal reactivation offer: those who purchased last winter were sent a voucher to spend in the spring. Come February they sent a reminder to say the voucher was live. ‘Amazon Dash buttons’ are a series of branded replenishment buttons for around the house that consumers can press to re-order when they’re running low of that product. While dabbling in the ‘internet of things’ is probably out of the question for most online retailers, sending a reminder to re-stock on a product is something that can be achieved with less hassle (providing you have access to the right customer data), and is a great way of extending a customer’s lifetime value . 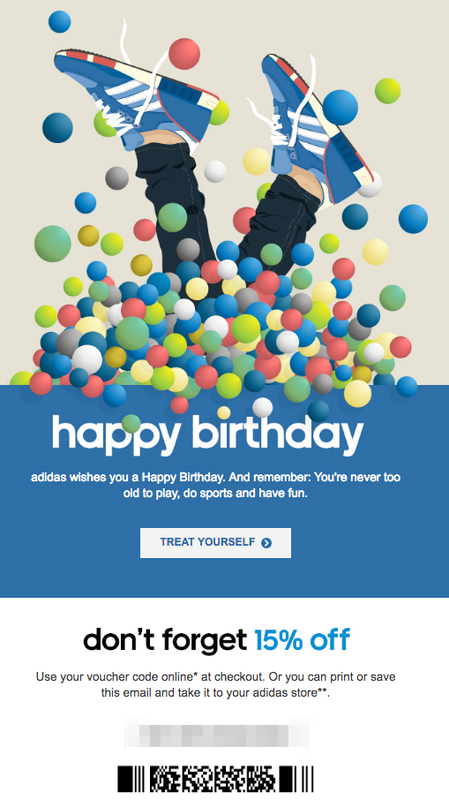 A study by Experian of 10,000 birthday and anniversary emails found that personalised birthday emails had almost five times the transaction rate of standard mail-outs. 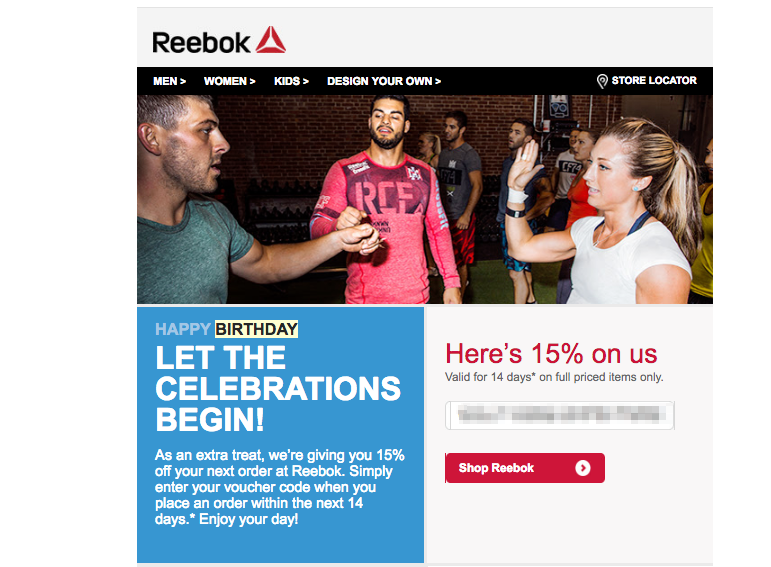 Clearly, catching customers while they’re celebrating(/commiserating) another year gone by is a lucrative business for online retailers. This kind of campaign obviously relies on you knowing a customer’s date of birth in the first place, but this can easily be incorporated into the newsletter or account subscription process. Below are nice examples from Adidas and Reebok. Active, loyal purchasers are the best types of customers to have if you want to enjoy long-term, sustainable success as an ecommerce business. Right after someone makes a purchase is a defining moment in a customer’s relationship with a brand: a time when you can nurture them into a repeat customer or let them fall off your radar. It’s therefore important that online retailers invest time and effort in creating post-purchase strategies aimed at keeping shoppers engaged and shopping.